What are the various minor oral surgeries? 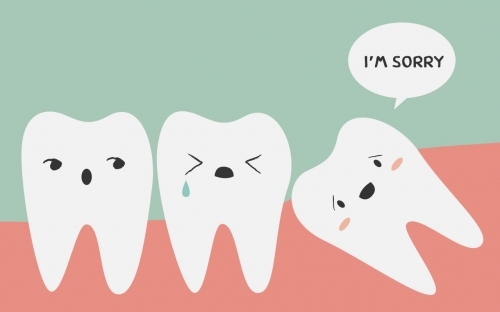 Wisdom teeth as commonly known as are the third molars of human dentition. They are called so, as they erupt at the age of 18-25 at which it is assumed that an individual becomes wiser. These teeth erupt at an age, when rests of the 28 permanent teeth are well settled in the dentition. Due to the evolution the human jaws are getting smaller and hence there will not be sufficient space left for the erupting third molars. So they either get locked in the bone leading to impaction or they erupt at wrong angulation. Either of these can create problems to adjacent teeth and the surrounding soft tissues. What are the various problems associated with a third molar? The wisdom teeth might get locked inside the bone called impaction. Third molars that have erupted more towards cheek may traumatize cheeks for long periods and are difficult to clean. So they develop decay and bone problems sooner or later. Sometimes the impacted third molars may develop cystic cavities (fluid filled spaces around the tooth in the bone) this induces bone loss and weakening of the jaw bone. 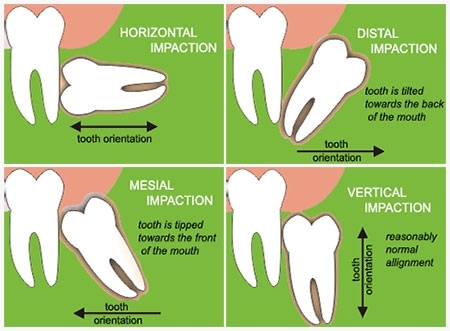 What is an impacted tooth and what are the varieties of teeth impactions? A tooth is said to be impacted when it has failed to erupt above the gum line. The teeth that are most commonly impacted are third molars particularly of the lower jaw, followed by upper jaw third molars and then upper canines. 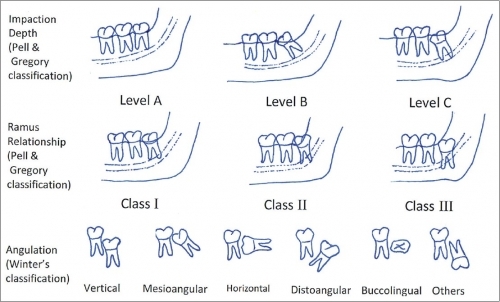 Varieties of lower third molar impactions: Due to the lack of space available for eruption, lower third molars get often impacted. Impacted teeth can apply pressure on adjacent healthy teeth and induce tooth ache and bone loss, can also contribute to cavities on the second molars and if they develop cystic cavities around then they can weaken the jaw and lead to jaw fracture eventually. So it is advisable to remove the impacted lower third molars at the earliest. 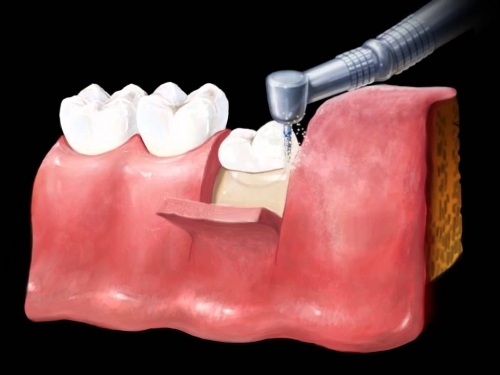 What is the procedure of removal of an impacted tooth? 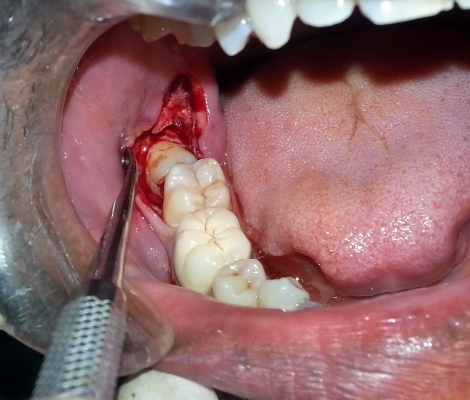 At the end, the soft tissue ends are sutured to close the socket and allow for healing of the site. Pressure packs and instructions are given after the surgery.